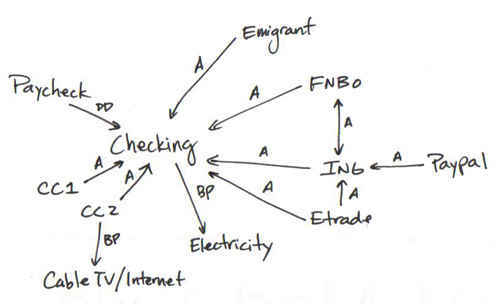 Mapping your financial infrastructure is a mundane task. It's not exciting. It's not likely to save you big bucks. Instead, it's the sort of Big Picture exercise that each of us ought to perform from time-to-time just to be sure that everything's working the way we think it is. If you do this every year or two, you just might catch some inefficiencies that need to be corrected. I did. I have a business checking account at Wells Fargo, a large traditional brick-and-mortar bank. This was not a conscious decision, and is a legacy from the origins of my former computer consulting business. Most of the time, these expenses are made with a business credit card, which I pay in full at the end of the month. From time-to-time, I move money from the business account to my personal checking account at the local credit union. This process is not automated. (In fact, none of my infrastructure is automated right now, except for paying a couple of bills, which I'll explain at the end.) To transfer money, I have to write a check to myself and go deposit it. I have a second checking account at a different credit union, but I rarely use it. I opened this about a year ago because I was intrigued by the chance to earn 5% in a rewards checking account. But the nearest branch is 15 minutes from my house and out of my way. That's a huge passive barrier to using it. I guess what I should do is just put some cash in there and see if I use it enough to qualify for the bonus interest rate. The bulk of my money sits in a high-yield online savings account at ING Direct. Actually, I have multiple accounts at ING, which I manage from a single screen. When I have money to save, I move it from my credit union to the appropriate savings account. This is done electronically, but it's not automated. I consider this my main pool of money because it's where I track my progress as I save toward specific goals. I've never actually moved money out of an ING account yet, so I don't know what that process is like. I carry four pieces of plastic, each of which has its own use. First, I carry a personal credit card. I lived for nine years without a personal credit card because I had a history of abusing them. But when Kris and I were preparing to travel overseas, GRS readers recommended obtaining Capital One No Hassle Cash Rewards cards for the trip. I also carry a debit card that is tied to my personal checking account. I use this for any purchase that I cannot (or will not) put on credit. For example, I have a rule that I won't purchase comic books or videogames on credit, so those expenses go on my debit card. Finally, I have two business credit cards. The first is a Visa from Wells Fargo. It offers no perks, so I try not to use it. The second is the TrueEarnings Business Card from Costco and American Express OPEN, which offers cash back on a variety of purchases. I try to make all of my business purchases with this card, and I really wish I could use it for personal expenses, like fueling the car. My main retirement account right now is a Fidelity self-employed 401(k). I love this account because it lets me contribute up to 25% of my income — and I do! Plus it has a huge cap on contributions, which gives me something to aim for. As much as I love Roth IRAs, I've been prioritizing this account lately because it makes the most sense for my situation. I make lump-sum contributions to this, too. In my dream world, the connections between all of these accounts (and the bills they each pay) would be both automated and paperless. I've made some progress toward a paperless personal-finance system, but little of my infrastructure is automated at the moment. I have automated payments to a few of my bills (auto insurance, natural gas), but that's it. Because my finances have been in such a state of flux over the past eighteen months, it's been impossible to automate anything else. One month my income is up; the next month my income is down. We're making accelerated mortgage payments; then we're refinancing. I quit the day job. I'm doing dollar-cost averaging into a Roth IRA; then I'm making lump-sum contributions to a 401(k). And so on. Things keep changing! I can foresee a time toward the end of 2009 when things will have finally settled down. When this happens, I'll begin to automate the connections between my accounts. I try to sit down once every week (though lately it's been more like once every three weeks) to scan my financial documents. I convert them to PDF, archive them on my iMac (and to my backup hard drive), and then update all of my bank accounts. I keep tabs on my accounts day-to-day, but I only update Quicken (and QuickBooks for the business) once per week. Ideally, I would receive only electronic statements. It's nice that I can convert my paper receipts to PDF, but I'd rather receive them that way in the first place. That's something to aim for. Also, I do intend to give another shot at using an online money-management tool. I'm going to start with Wesabe, and if that doesn't meet my needs, I'll try something else. Writing this out makes it seem more complicated than it really is. Things are actually fairly streamlined, with only a few weaknesses. I have two business credit cards. Ideally, I'd have only one. However, American Express is not accepted everywhere that Visa is. This means I have to carry the extra Visa card around to cover the exceptions. I have checking accounts at two credit unions. Ideally, I'd use only one. If my main credit union offered rewards checking, this choice would be easy. It has branches conveniently located in all of my main stomping grounds. I would like to consolidate my retirement accounts with one provider. This means I'll probably be moving my Roth IRA from Sharebuilder to Fidelity. The Fidelity self-employed 401(k) is a fantastic product, and I'm not giving it up. What about you? What are the key components of your financial infrastructure? Do you have accounts that you would recommend to GRS readers? Is your financial network map simple or complex? Do you have accounts that you never used? Have you automated things? Do you plan to? Do you have suggestions on how I could improve my setup? 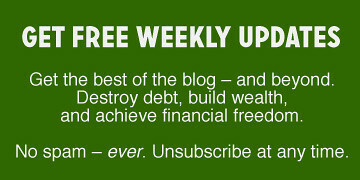 There are 80 reader responses to "My financial infrastructure". This is a very interesting approach . . . I have something similar (but not as deep) setup in Excel on different worksheets– makes me want to dig deeper. I actually like the idea of doing a little sketch. It gives me a different perspective on things and is kinda fun. Too bad I can’t draw though. My husband and I were just talking last night about reorganizing and simplifying our accounts. This would be a good approach to that. We’re looking into money management software — I “handle” most of our money and he’d like to have an easy way to look at our overall money picture. I first thought of Quicken, but have read a lot of good things about YNAB (some former Quicken users seem to prefer it). I’d love to know what other readers use and which software they prefer. I UNautomated many of my transactions last year after a bad experience. No longer can I trust the “machines” to do my work for me. The only thing that is still automated is direct deposit. If my employer forced me to deposit to one account only I’d drop that too. Thankfuly they don’t so my DD goes into 5 different accounts. Where online do you archive your documents? And what all do you archive? I have all of my savings and checking accounts set up with one bank…USAA. In my opinion USAA is a cut above any other financial institution out there when it comes to customer service, bank features, and finacial products. The one exception being their mortgage division. Their rates and fees come no where near what my local credit union could do. Membership with USAA has traditionally been for officers in the US military, but they have since expanded their membership critieria to 2nd and 3rd generation family members of retired military personnel, as well as former non-retired military members. Its worth a call to check and see if you are eligible. Some of my favorite features include. ATM fee reimbursement from any ATM in the world (up to $15 a month). Deposit check from home using your scanner. Competitive interest rates on savings accounts. UNBEATABLE Rates on car and homeowner’s insurance. sorry for the long comment, I just love USAA! I like it! Getting the big picture and the flow of anything that we’re doing (or are a part of) is a good thing. And not everything has to be fun. Lots of things in life we do because it’s the back-stage and the infrastructure (good word you used) of fun. Delayed gratification rocks, whether we’re dealing with money or life in general. Self-Employed 401K’s are an amazing option for tax deferral. Probably one of the greatest benefits of being self-employed. Glad to see you’re using it over other options like SEP’s and SIMPLE’s. When my husband and I got married, I tried keeping up with his accounts and mine as we were trying to pay debt and save money. But 2 checking accounts, 2 money market accounts, and seven credit cards was just too much to track. We paid off all of the cards, closed two CCs with low credit lines and short history, closed his bank account and moved him to mine (a credit union), and opened up joint ING accounts. So now we use only one credit card and we have a checking account, Roths, my 403b, and our ING accounts (savings, but with subaccounts). I can still seem like a lot when I’m reconciling accounts in Quicken, but really, it’s pretty simplified, and consolidating our accounts gives us the big picture look at our finances. First, great job with the show yesterday. I appreciated you taking my call and thought it was awesome they let you extend it 30 minutes on the spot! This article really hit home because I know that everyone needs to do this type of mapping every quarter or so. For me, I try to simplify my accounts and infrastructure as much as possible. I don’t like the business credit card though, because for me (especially online books etc…) I always find my-self drawn to spend over 1% more on a credit card than I would on a debit card that I knew would immediately impact my balance. You’ve been working through your credit issues for much longer than I have, and seem to have a very good grasp of your impulses and nice control. I still wonder in the back of my head if you’d be better of using a Business Debit Card instead, to help potentially curve any random expense that is nice, but not necessarily needed for your business. Either way this article has inspired me to go through my own infrastructure again and see if there are any ways I can simplify and/or automate to streamline the process. Oops. “Online” is a mis-statement. I merely meant on the computer. I’m going to change the text of the article to reflect that. I use sneakernet to archive my files and documents. That is, I don’t archive them online; I archive them on an external hard drive. Kris and I recently purchased a small safe (which was far less expensive than I had anticipated), and I keep the external hard drive stored there. Once a week, I pull out the hard drive and back up my data, including the scanned documents and the files from Quicken and QuickBooks. All that being said, when my hard drive crashed last fall, many readers offered suggestions for online backups, including a service called Mozy. I still haven’t tried any of these tips yet, though. Automation is a beautiful thing. I have everything except one bill automated, and it only comes every two months. I like to sit back and watch as my income filters itself into bills and savings without me having to force myself to save. JD, how long do you keep your statements, receipts, etc? After you back them up electronically, do you get rid of the paper version, or store them as well? I use Advantis CU in Portland, but live in CA. I don’t have a bank down here. My paychecks are direct deposited and any other checks received throughout the month are mailed to the bank for deposit. Haven’t had a need to step foot in a bank in 10 years. I keep business documents indefinitely. I immediately shred non-business documents, except those that are most important (such as re-finance docs or tax docs). I have to concur with Benjamin’s comments on USAA. What a refreshing company. Great website tools. Great service. Great rates. If you have a number of different financial institutions, retirement accounts, etc. – try using mint.com so you can view all accounts on a single screen. It’s free and easy to use. I have to second the USAA site. I have a checking, savings, 2 credit cards, debit card, Roth IRA, trading account, Home Insurance, Car Insurance, Personal Property Insurance, and home loan through USAA. Other than the home loan all other accounts are viewable via one page. I can automate all transactions so I never have to manually make a payment, this includes the credit cards to pay the balance with each statement. Sounds petty but it is good cash management to pay on the due date versus a few days early. My families 401k’s are much more disjointed as they are with employers. I also have an ING account which doubles my interest income versus USAA. Finally, I pay for Finicity service (envelopes) and the software has functionality to access the balance of all my accounts at all the institutions. Having Finicity is paying for itself as I only spend what is budgeted and use a credit card for almost all my purchases. This allows me to float the cash in my account and gain interest while Finicity sets that money aside so it can be used to pay the balance in full at the end of the month. All of this while making the 1%-2% cash back. If it was not for Finicity (any budgeting software could work) I would have a hard time visualizing my expected financial outflows in the short term. I tried using Mint but was not able to customize it enough to meet my budget demands. I have envelopes that are funded no more than $5 or $6 a paycheck. Great article! My finance/investment strategy professor in grad school made us do this for our final exam. I thought it was a different idea for a final (which I preferred since it was take-home). He wanted us to do this so that we could see the big picture while working at the macro level as well. He said he wished he had done this when he was younger (he is currently approaching retirement but has been very successful). After the exam at the end of class, I can honestly say that of all the exams this has had the biggest impact for me. His goal was to help us map out our long term goals and financial map at the same time (and as you stated J.D. create a written plan which he entitled your “Wealth Management Plan”). I incorporated all aspects from banking, investing, saving, insurance, etc. This shaped the way I started to live after school and was the most helpful of all the final exams I ever took. I highly recommend mapping this out (I was interested by the drawing and now I’m going to attempt that this afternoon). Currently I have the written plan which I revisit each quarter of the year (which is quickly approaching). JD, everything I read about financial management software (Quicken, MS Money) leads me to believe it won’t do everything I want to do. In order to gain access to higher-powered software, I’d like to hire a fee-only NAPFA advisor who is also trained by Ed Slott on IRAs. Neither Ed Slott’s folks nor NAPFA keeps cross-references… So, I have no advisor. Have you ever done an article on fee-only advisor successes and failures regarding software interface with the advisor? If I could find an advisor who had good software, they’d have a customer for life. By good software I mean: Software that allows me to play what-if games on my own finances. The master copy can be kept with the advisor, but I want/need to be able to play out Monte Carlo scenarios of interest rates, inflation, investment assumptions, income assumptions, social security (early/on time/late) assumptions, etc. – without having the advisor generate a new (costly) report each time. The day someone offers this, affluent boomers will beat a path to their door!!! I have recently moved to a fairly complicated financial map because it helps me stay more organized. I have automated almost all of it with the main exception of having to manually pay the balance on my credit card each month. One thing that I did recently that is really helping me is opening a second checking account for the sole purpose of paying my regular automated bills. The problem I was having was knowing exactly how much uncommitted cash I had left at any one time because most of my bills were paid near the beginning of the month, and some things (like insurance) I only pay 4 of every 6 months. I have all my income going into my regular checking account, and then each week I have an automated transfer of 1/4th of the monthly cost for all of my automated payments (mortgage, car payment, utilities). At any point in time, I can sum my regular checking account and my credit card balance and know exactly what I do or do not have available. I don’t automate much, because otherwise I won’t keep track of things. But I do like to do everything from home, which is why my Etrade account is the hub for everything. Each month my paycheck goes into it, and I transfer out my budget for the month to the credit union, where I pay my bills. A second transfer from the Etrade account goes into my IRA (that’s the automated bit), and I stay well below the transaction limit on the account. I haven’t actually been to the credit union in ages, since I moved and there’s another one closer whose ATM I can use. I don’t know what you do when you go into the branch, but since most credit unions share ATMs, that setup might work for you to keep the rewards checking. JD – scanning all your documents seems like an extra step. I get all my bills except water/sewer emailed to me or accessed through online banking where I can print them to a PDF and file in my folder called “File Cabinet” where I have subfolders for everything I need. Good idea on the infrastructure sketch though – I’m going to fire that up tonight. I’m Canadian, and I have to say that I’m a little jealous of all the options available to my American neighbours. Of course, part of the problem is that most of the information I take in through blogs and articles comes from the U.S., so I probably don’t even know what I’m missing. Don’t tell anyone, but I’ve been with my credit union since I first opened an account (probably around age 12) and have somehow managed to fly under the radar enough that at age 26 I still use my youth account, which charges minimal fees. I don’t get a great interest rate, but since I only have a few thousand dollars put away at a time I think I’m coming out on top. This site must be running out of material. Long time reader but now its the “infastructure” map? How many angles can we really take looking at personal finance? Can you also have one of those Fidelity self-employed 401(k)s? For your earnings from the side business? My organization is in a state of flux. I had a credit card that paid 2% back on my mortgage, but the bank association between the CC and the lender was dissolved this month. So I’m looking at possible other reward cards. That may turn into two (one for gas/groceries and one for everything else). I put everything on that card then broke each purchase out by category to track against my budget. But that won’t work anymore. I am definitely going to use that chart and file it with my other money stuff. I take care of all $ stuff in our house and I want a record for DH if something were to happen to me. I also recently UNautomated all of my accounts. It was part of the process that also led me here, a get on top of my personal finances. Two months ago I didn’t know how much money I made a month, or even a paycheck. Everything was automated and had been for about 5 years. Then I got a notice in the mail that I had bounced a check. It is a good thing it came in the physical mailbox, otherwise I might have paid as little attention to it as everything else. Now I still use e-statements and online bill pay for everything (most places offer a bonus a few times a year for going paper-free) but very few items are auto-paid anymore (i.e. student loan), and nothing variable. I am forcing myself to see how much comes in and goes out. One day I might be back to all auto, but for now this is the only way I have of ensuring I am active in my finances, no more, oh that went out the other day I’ll look it over next month, now if I don’t do it, it doesn’t get paid! Any additional ways to get looking at finances from a new angle are really helping me now. One huge suggestion I would make, because it’s something I do and I feel helps me manage my bills which are almost all automated, is open a checking account out of which JUST your bills are paid. Use automated debiting which almost all billers offer these days, or if you’re not comfortable with that, or if it’s not offered, then use online bill pay through your bank. Because I have Wachovia and have been researching Wells Fargo, I know WF offers it. I keep a spreadsheet every month with the amounts of my bills, then have my paycheck automatically deposited into my two accounts and transfer (again through online banking) any extra amount needed into my ‘bills’ account. Since I started doing it this way nearly 3 years ago, I haven’t been late on a single bill. I’d be happy to describe in more detail the spreadsheet I keep, if you would like. JD: You might also consider Amazon S3. Several Mac ftp clients can handle the S3 protocol (e.g., Interarchy and possibly Transmit) so you can just drag and drop to their servers. Totally redundant. As close to fail-safe as you can probably get, and it’s off-site. Pretty cheap, too, if you’re not storing massive amounts of data. I can speak to the differences between Sharebuilder and Zecco, I have used both quite a bit. It really comes down to cost and interface. Sharebuilder is very easy to use, and it interfaces with ING nicely. If you’re only buying shares automatically every Tuesday, its only $4, but I think its $10 if you do any real time trades. Zecco’s interface is not intuitive AT ALL, but its cheap. $4.50 a trade, and some are free if you meet certain conditions ($25k in your account gets you 10 free trades a month. I prefer (and have switched to) Zecco because I am cheap. Sometimes the interface if frustrating, but I do enough trades that cost is a factor for me. Although you can very easily use ING’s website to transfer money from your ING account to a linked bank account, for some reason ING won’t even report it to your bank until two business days later. In my case I requested a transfer of $10,000 around midnight last night and I got a message that it would not go through until March 25th. Then who knows how long it will take for my money to actually make it into the bank account? I will keep you posted on how long the whole process takes! To continue the USAA discussion, they also will open accounts for enlisted vets. I have my car, insurance through USAA and also have my life insurance through them. A 20 year term for $300,000 for $18.00 a month. I’m sure there are probably some better rates out there, but not with a company I trust as much as them. USAA is the best. I’ve been with them for 25 years on insurance and they have great service. I just wish they paid more in interest on savings accounts. So I have an acct with FNBO. As I move towards investing more money I would have a preference for the organization also providing a great rate for a simple savings account. Seems like the big guys like Vanguard and Fidelity would see that it would be a great way to lure people in/grant entry to their investment funds. One company has my mortgage and my rewards cards–they are slime, but they bought my mortgage and they have the best rewards. My credit union is not slime and has my checking account, a $500 savings account (good for instant access in emergencies) and my credit card with the good interest rate (which I haven’t used in years and years, but it’s good to have one of these, and it’s one of my oldest credit cards). Connected to to my credit union are my online savings accounts, one or two of which I should close. I’m keeping ING in case it gets good again (or at least until my CD there expires) and FNBO, my current best one, but can’t figure out how to close Emigrant. I’d like things to be simpler, but I’m still okay with my current complexity, and I sort of like diversification. I’ve heard of banks freezing everything, or you could forget your password and be locked out of your account, or your credit/debit cards can be stolen and then locked. Who knows what could happen? So it’s nice to have another place to turn. I definitely like my partner using a different bank, though we do use the same broker. I have automated some things with constant monthly payments that I don’t expect to have to cancel (paycheck, mortgage payment, IRA contributions, Netflix), but not anything variable (utilities) or slimy (gym membership) or both (rewards credit cards), though I do pay those online. I get paid monthly and when I add that amount to my checkbook register, I subtract all the regular payments right then, even though they won’t actually be withdrawn for days or weeks. Then I see what’s left (calculated account balance minus current credit card charges) and transfer the rest (above a cushion) into savings manually. I have no suggestions for your set-up; you’ve been evolving it for a while now. Just see if you like anyone else’s ideas. My set up is very simple. Checking – Homebase for everything. Paychecks go in, savings and bills go out. Earns a small amount of interest. Savings – Money for bills that are semi annually, bimonthly, etc. CDs – These hold my emergency fund. Early withdrawal penalties are such that I will never forfeit principle except in the first 7 days of the term. Savings – various small savings goals that are too small to open a cd for. Funded from my CU checking account. HSA – Also deducted from paychecks. This account has a debit card, check book and auto bill pay for my convenience. I’ve thought about closing out ING now that rates are so low to further simplify things, but I decided to leave the option open for now since it is still a good place for smaller goals. ING works great for an emergency fund if you also have an ING Checking account. Money transferred between ING accounts is available immediately. My car unexpectedly overheated and I had to replace the radiator. I was able to transfer from my ING emergency fund to ING checking and pay the mechanic without any waiting. Wow – writing it out really does make it look complicated even as it simplifies it. It’s good to get this kind of visual, though. I’ll have to see if I’m brave enough to tackle this for my own finances. Are you sure you haven’t discussed this on your blog before? That diagram of Jim’s looks familiar … I thought I saw it here. That might have been Michael (#23)’s point. I’ve been using ING for “envelopes” savings/budgeting, and have transferred money back to my main credit union account. It’s very easy, especially since all the things I’m paying out of the ING account are planned expenses… so I know when they’re coming up. I just schedule the transfer two days ahead of when I actually need it in my CU checking account, and it all works out. BoA likes to charge for its savings account so I only keep checking accounts with them. I’m good at organizing the person finances. However, I would love a post on how to organize all the various 401K’s from past employers. I have no idea whether to consolidate them all to my current employer or roll them all into a IRA. Great post. I am going to make my map this evening! I use an ING checking account for direct deposit and several ING savings accounts. In the very rare cases when I need to write a check I move money to the linked checking account – I have done this many times and there is a slight delay of a couple of days but otherwise there are no issues. I use ING free bill pay for the bills that are not automatically deducted. To help keep track that there is enough money in my checking account for the automatic deductions I use the bill reminder feature in Quicken. It can be set up to automatically enter the upcoming bills/transfers so you can see a few days out that you have enough in your checking account and what your projected balance will be at any date in the future. When you update your account balances (have Quicken retrieve your account information automatically) the transactions will match to the reminders so there won’t be duplicates. The biggest thing I wanted to do this year was make both payments and savings more automatic. But a couple weeks ago I was paying some big bills and cutting it very close, to close in fact because I had forgotten to take in account a couple automatic bill pays which went through and made us in the red. I found out on a Saturday. I quickly transferred money from my electronic emergency savings to my regular checking. My GMAC account recently changed from a money market to a savings account, and that’s when I found out transferring money would take 4 business days (the transfer made on Saturday morning did not clear until Thursday!). Anyways even though I feel I have a handle on finances it seems the more things are automated the more likely something like this is to happen, so I am going to hold off automating until I have a better handle on what the range of possible ingos and outgos should be. Ah. I get it. You guys think this might be a re-run. I do think I pointed to this from a links round-up, but I’ve never actually written about my own infrastructure before. I have almost everything automated. My paycheck goes directly into my checking account. From there I have automatic deposits set up for my ING accounts. My ING is set to automatically deposit to my Vanguard Roth IRA target retirement. Every few months I also make a larger manual transfer from ING to Vanguard into other funds that I’m interested in. My 401k is automatically removed from my paycheck. I have a rollover IRA I do not touch, since I can’t add new money to it. I have one credit card that I use 99% of the time. If for some reason I have to use a backup card, I pay it off as soon as the balance is posted. I try to automate monthly every bill I can to be directly charged to the card since I get points. Cable/Internet, cell phone, and gym membership are all charged to my credit card. My renter’s insurance renewal also goes on my card. I attempt to charge everything possible to reduce the amount of cash I carry. Usually at the beginning of the month, I login to my accounts to pay bills. I pay them all at the same time. Most of the time this consists of just a credit card payment and my student loan payment. I could automate the student loan, but there’s annoying paperwork involved. It’s easy to do it online, so I’m fine with that. I schedule the credit card payment for mid month and my loan for end of the month both around the time my paycheck hits. Things like rent and other household bills, I write checks and receive checks at the end of the month to and from my roomies. I can’t automate these as there are 3 of us that split bills. The best we can do is start an email chain of who owes what and who needs to pay. Just in case I usually keep an eye on all accounts and login about once a week. Mint helps to reduce the amount I login to each individual account. This allows me to find any erroneous bank fees or credit card charges. I’ve saved $100’s by paying on time and keeping an eye on my finances. Main Checking account – with a regular Brick and Mortar bank (BB&T). This is sort of the central hub of it all. Mortgage – actually with the same bank although that was not necessarily planned. Our original mortgage was with them and we just refinanced with them for the third time. Had the same rate as the CU and lower fees. Savings – Like JD I have several named savings accounts at ING. I have an emergency fund, house taxes fund (we don’t escrow), car fund, vacation fund, christmas fund, special projects fund and taxes fund (I am partially self employed). I do have a savings account at the credit union also but it only exists so I am a current member of the credit union. That way if I ever need them I already have a relationship established. Credit card – One from my bank which I never use. My husband and I also each have one with USAA (rewards card) but we only use the one in my name and pay it off every month. Insurance – almost every insurance product we have (life, home, car, umbrella, personal article etc) is with USAA. As with the posters above, I can’t say enough good things about them. Investments – I have a Roth and a SEP IRA with Fidelity. My husband also has a Roth and a Rollover IRA with Fidelity. Another company that I have been very pleased with. 529 plan – I used to have this in a plan managed by Fidelity (New York’s, maybe? I can’t remember now). I moved it a couple of years ago to Iowa’s 529 plan which is managed by Vanguard (lower fees). Everything moves in and out of my BB&T account. I keep track of it all using YNAB as my budgeting software. This has more or less the way things have been connected for several years and it works well for us. I think a lot of people would love the story behind the frisbee and your bank account in college. Nice post! I’ll have to draw one of these pictures for myself. I moved to ING Direct for my primary bank last year — checking and savings. Direct deposit is split (on my employer’s end) between checking and savings, and then bills come out of checking. This was a key thing for me: I get paid once a month, so I rescheduled the due dates of all my bills to be right at the beginning of the month. Once everything has been paid, I transfer a big chunk out (either debt snowball or savings, depending on my current goals) and leave just enough in that account for food and entertainment for the month. I pay some things automatically — most notably my student loan payments (I get an interest rate bonus for letting them take it directly out of my account). Others I pay with the free bill pay from the site — credit card payments, utilities, rent. (I don’t like trusting other parties with my bank account information, so for variable amounts that I can’t autopay with my debit card #, I’ll usually do it manually from the bank side.) I set up paperless bills for everything, so I just add them to my “bills” label in Gmail as they come in, and then deal with them all at once when I get paid. Still have a brick & mortar account, WaMu-now-Chase. I don’t much like being a Chase customer now, but I just use the account for depositing checks, so I haven’t bothered switching to a different local bank or closing the unused savings account. Yet. I’ve also got a couple of student loans and a couple of retirement accounts (old 401(k), current 403(b)). These I basically ignore, though eventually I want to roll the 401(k) into the 403(b) (or into a Roth, or something). I check up on them once a month, when I update my net worth spreadsheet. I keep track of the bank accounts and credit cards on Wesabe. They’re not as polished as Mint in some ways, but I like their privacy/data storage policy a lot better, and they have a very responsive support team and a community of very smart and helpful users. I’ve tried to read this post several times and I really feel like I get lost every time. So, instead of trying to find some insight in J.D.’s system, I’m going to skip to the end and describe my own. What are the key components of my financial infrastructure? 1) One checking account with associated ATM/Check card. 2) One online savings account. Almost everything is automatic. 401k contributions are automatically deducted from my pay and deposited in my 401k account. The remainder of my check is automatically deposited in my checking account. My bills are almost all (except for my rent) automatically deducted from my checking account. Most actions dealing with the brokerage account are automatic and relate to my employer’s stock vesting, although I do have to conduct trades or sales manually (but I mostly just leave this account alone). I do manually transfer funds back and forth from checking to savings, but this is mostly just to make me feel good, it doesn’t actually affect my financial position very significantly if I leave funds in one versus the other (I lose a small amount of interest in anything that sits in checking when it could be in savings). This makes everything very simple, which makes it more likely that nothing will get lost, or fall behind, or cause me to stop working on it because it’s too much of a pain. If I continue going to work, and I pay my rent by the first of the month, my finances all stay current. I don’t *have* to do anything else, except for the occasional extra bill (such as from the DMV for renewing car registration). To be honest, I have some other accounts and things not listed above, like a business credit card. I didn’t include it because it’s not a “key” component of my finances, and I almost never use it. I’ve only ever actually received a bill for it once, when my work sent me to Germany and I bought a lot of meals and things for which I’d need to be reimbursed. I try to avoid things like this as much as possible, and even if I have the accounts, I have no day-to-day interactions with them. Personally, I find the simpler the system, the better. Maybe this is why I found J.D.’s description so difficult to read, it’s just a big long list of what must be at least a dozen different (but many wit the same basic purpose) accounts, and I don’t see the benefit of having (for instance) four plastic cards for purchasing things. You can have more than one 401(k) plan, much like you can have multiple IRAs, just be sure you don’t exceed the annual statutory contribution limits (easily found at the IRS website). I also use USAA and love them. I use their bill pay and have several accounts: 2 checking, 3 savings, my main credit card, and my renter’s & auto insurance are all there. I have opted NOT to automate a lot of things, though. My retirement savings are deducted pre-tax, and the balance is direct deposited to one of my checking accounts. After that I prefer to manually transfer funds around. I like recording things as they come & go, but I am SUPER low tech: I keep an email folder and send myself twice-monthly accountings of my transfers. I also use pen & paper to track my spending. I love having a separate checking account for bills. I transfer in half of my monthly needs each paycheck, and never sweat my rent or other bills – the money’s there by mid-month. I pay my credit card in full, and manage my bills there too. I don’t trust companies to correctly charge me, so Netflix is the only thing that auto-charges to my credit card (because I didn’t see any other option). Courtney, Banks work on “business days”, not on hours. Thus, The ING transfer is effective “to start” ON the business day it is initiated. (In this case the 24th) The ING disclosure will have all this info one needs to be aware of. So, what happens is they extract the money at the end of the business day in question, and it goes via ACH (automated clearing house) to the bank in question for receipt and processing the FOLLOWING business day (the 25th, at a minimum). Smaller local banks may work off of ACH from a larger regional bank, adding another business day to the actual receipt of credit. No offense, but if you want same business day servicing, you need to request and pay a wire-transfer fee. J.D., several people have already mentioned this, but I REALLY think you should try YNAB (You Need a Budget). It is specifically designed to deal with cash flow AND irregular income (using a unique approach based of prior’s month’s income…). My husband’s employer stops me from fully automating everything. They only got direct deposit in 2008, and the retirement stuff is still carved in stone tablets. An intentional inconvenience is my credit union account linked to my PayPal account. I’ve had so many issues with those slimeballs at PayPal, I don’t trust them with even a separate account at my regular bank. I’d love to put all our regular bills (especially utilities) on our credit cards, but it seems to still be the norm to charge you a fee for doing so. I will never do auto-pay, though. I’ve heard too many horror stories of double billing, changed bill dates causing overdrafts, and on and on. I’ve used this method for many years. I guess mvelopes or mint can also do the bucketting for you, but my method is free and visible each time I go online to view my accounts. Essentially, whatever is left in checking is my funny money. Most bills go to my credit card, and those amounts are paid out of my charity and savings accounts as appropriate (bills from savings – tithe and one time donations from charity). I’m with you.. USAA is the shiz. Customer service is superb, too. My recommendation on old 401ks is to roll them into one IRA at a brokerage like fidelity. This is what I have done with one of mine (need to do the other, but I’m so dang mad at how low the balance is, I’m just not ready to lock in the losses…). I would NOT roll them to my current employer because you have unlimited investment choices at a brokerage house whereas your current employer might have 20 investment options, tops. Another benefit to rolling to an IRA at a brokerage house is that in 2010, the IRS laws change and you will be able to convert all or part of that IRA money to a Roth. There is no limit on the dollar amount you can convert. So, depending on your plans long term, you have an opportunity to bulk up a huge balance in a Roth where otherwise you would be limited to the $5K/year Roth contribution. It’s an opportunity, albeit one that may or may not matter to you. I don’t understand the obsession with wanting to get electronic statements *at all*. A statement on paper is irrevocable and indisputable proof you have (paid) amount X on item or account Y. An electronic statement of anything is neither irrevocable nor indisputable, not to mention *highly* volatile. These are not properties one is looking for in evidence. When it comes to online money management, I highly recommend MINT.COM. It’s a fantastic budgeting and expense tracking tool that let’s you view your financial activity in comparison to others in your area and across the country, by type of expense. This can help you identify red flags, and has the psychological benefit of seeing where you spend LESS than others as well. Just a quick note…I bet the open source tool FreeMind would work great for laying this out if you didn’t want to draw anything by hand. A paper statement is no more irrevocable than an electronic one. You can “revoke” the electronic one by stealing or destroying my personal computer. You can revoke the paper one by by stealing or destroying my filing cabinet. Same goes for indisputability: Certainly you can fake an electronic statement using tools like photoshop. You can fake a paper statement by using tools like photoshop and a printer. Electronic records *may* be slightly more susceptible to loss than paper ones if you don’t back them up, but paper documents suffer the same problems due to fire, flood, misplacing them, etc. How competitive are the brokerage costs for INGdirect’s sharebuilder program. I am always concerned about brokerage costs and fees with my accounts. For instance, with scottrade $7 to buy and $7 to sell on a $500 investment means I am already down 2.8%…add inflation, add taxes…yikes! How does INGdirect rate compared to say a Vanguard? @Tyler: I can revoke your electronic statement simply by issuing a new one with fabricated data, there is no need for elaborate burglaries. How do you prove that the electronic statements you own have not been tampered with? You cannot. This is not the case with paper statements, issued by a bank on paper from a bank, printed with inks from a bank. Undetectable -by a court of law in case of a dispute- faking of a printed (bank-)statement is *orders of magnitude* more difficult than undetectable faking of electronic statements (until electronic statements are cryptographically signed, of course). More importantly, in the case that a dispute rises *you* have the paper copy and it is up to the *other side* to prove that your paper copy is a fake. This is expensive in the case of paper statements, but in case of electronic statements where there are two conflicting statements it might even be impossible to state either way. Which outcome would you prefer? And, lastly, given the same care in organizing, the chances of having your paper statements become unreadable in general are again orders of magnitude smaller then the chance that electronic statements become unreadable (hard disks fail, backups fail, grey matter fails, hard disks make bit-errors, memory makes bit-errors, etc, etc). @Courtney #34 Just wanted to pipe in to let you know how the process works with ING and transfering money. I work for ING so the way that it works is we always tell customers that it takes 2-3 business days to transfer money. Let’s say you request a transfer on Monday at 6am to leave ING to go to your linked account. ING will not process that request until end of business (which for our bank is 10PM CST to accommodate the folks on the West Coast)Processing usually starts a bit after midnight to be ready to send to the Federal Reserve for the ACH transfer the following morning. The ACH bundles all the requests for various banks and has it available for “pick up” by all the banks around mid afternoon(in this example on Tuesday). They then post after their close of business and have it ready for you to see or retrieve the following day (2nd business day, in this example Wed morning) If this is done on the weekend or on Friday it will not start the process until Monday thus delaying the process by a couple of days. I hope this clarifies how the transfer works, most banks use this same system but the process time may be accelerated if the bank has a close of business at 3pm so they can get everything to the Fed Res before the Feds close of business on that day. You can get an American Express TrueEarnings card for personal expenses. It’s great, we got $160 rebate this year. We only use it for gas, dining out, travel, and costco purchases. It more than pays for the costco membership. @Mrten: You can’t revoke my electronic statement simply by issuing a new one. If you issue a new one, and I have my copy of the original, then we now have two conflicting electronic statements, either (or neither) of which could be the original. Cryptographically signing bank statements is trivial and can be done with freely available technology today. The chances of paper vs. disk failing are situational and I think you just made up your “orders of magnitude” statistic. Can you show me the source for that? The issue of a court of law being able to detect fraud in my banking documents is moot, anyway. If I have faked my own documents, I know whether they’re authentic or not. If the bank has faked their (supposedly original) documents after the fact, to make it look like mine were phony, then they can fake them with the same paper and the same ink that they used when they printed my original. Further, if I think a bank might do this sort of thing, I probably shouldn’t trust them with my cash, anyway. And if they would do such a thing, there are probably easier ways for them to defraud me. Regardless of the difficulty of proving the originality of banking documents, it’s a process that’s almost never necessary. I have never in my life been asked to prove the authenticity of a document provided to anyone. Almost everyone accepts faxed copies of every document for every purpose. Even if they don’t, they accept anything that *looks like* an original, they certainly don’t verify the type of ink it was printed with. Certainly I could conceive of the case where I could have to prove the authenticity of a document in court, but the chances of it actually happening to me seem to be astronomically small. The inconvenience of keeping paper copies of all this information far outweighs (in my, and many other people’s opinions) the 1 in 100,000 (or some other very low chance) that someone will sue me and the format of my documents will cause me to lose the case. Maybe 1 in 100,000 seems like an unreasonable risk for you. That’s OK, and if you want to keep paper documents to mitigate that risk, no one’s going to stop you. However, this seems like a very *small* risk to someone like me, and I’m OK taking it. Just for comparison’s sake, I have a greater than 1 in 250 chance of being killed in a car accident. That’s 400 times more likely than the (admittedly fabricated) chance of being sued and losing due to this particular circumstance, and the outcome is far worse, as well. J.D., I thought this was a great post. To me, divulging how you organize your finances truly makes your blog great. Pardon the pun, but it really does make it “personal” and I really think by doing that draws many of your readers in. Also, to all of you USAA people, stop making me jealous because I always hear how great it is and that I cannot get in because I’m just a civilian. This gave me a whole new idea when I work with clients trying to organize the flow of paperwork and money. My own is some what similar. I like to keep a minimum balance in a checking account and transfer money to cover my online payments. I charge everyday monthly bills to my credit credit and receive 1% cash back. I don’t automate these monthly charges, because I want to monitor the amount being charged to the card. I also wanted to further comment on #18 for Paul’s question on a simulation software. The best I have seen, so far, is called Life Balance Sheet. It is a copy right product that is only available through Guardian Insurance agents. Some agents may offer the software free as part of their financial planning package. This software is online and the agent as well as the customer has access to it. I have a similar system. I have a Business checking account, which does not have a card, and receives direct deposit from my employer. It doles out payments from there, which then transfers the rest to my Personal checking account. I charge my daily life to my personal checking account, like groceries, gas, prescription refills,…etc. My budget has been super tight recently to pay for the mortgage on a rental property that has no tenants (long story), plus my own rent, plus utilities for both items. So to try to keep organized, I fill in “notes” for each payday event on my MS Outlook. I fill in all the payments I must make, and I know exactly how much I have left to spend for the next 3-5 pay periods. I’ve also come to the habit of paying half of my utility bills from every paycheck electronically, so if for some reason I can’t pay one time, eventually it’ll get paid off. I guess this all sounds really slim, but planning all my money in MS Outlook helps me to be extremely organized about everything financial-related in my life. Love the blog. I’ve only been in the big scary “real world” for about year now and your guidance has inspired me and helped me start out on the right track. The tool that has KEPT me on the right track is Finicity Money Manager (formerly Mvelopes). After giving MS Money, Quicken, and Mint the old college try (literally), I was ready to go to Excel. Then I found Finicity. With Finicity, instead of looking back at how you spent the money you had, you look at the money you have and decide how you’re going to spend it in the future. It makes it unnecessary to have separate accounts for each of your savings goals, since all of your savings are split into envelopes. When you want to allocate money to something else, it’s just a simple drag and drop in the UI. It’s well worth giving it a try with the 30-day free trial. After that it’s around $9 a month depending on how many months you buy at once. Well worth it in my opinion. @Diane #72 Thanks, I’ll keep an eye out for a Guardian office, and may stop in to talk with the salesperson. @Trynian #28 Thanks, I’ve written flexibleretirementplanner.com down, and will eventually go play with it. But, since it doesn’t even do college planning how’s it going to do everything my 42-worksheet Excel file does (and more!)? I’m telling you there’s a market for software that the financially literate can use to enter ALL their financial data in – and then play ‘what ifs’. Even if it’s an adjunct to a NAPFA planner’s practice, I’d be willing to discuss it. I wonder why nobody on this site resonated off NAPFA advisors? Aren’t there any of you using one? Do you find that Quicken for MAC works well? My hard drive crashed and I’m contemplating a MAC but I’ve read some horror stories about Quicken on a MAC. Instead of scanning documents, it’s so much quicker and cheaper to use cutepdf or primopdf. They’re freeeeee! Wells Fargo gives you rewards on the personal debit card for free if you have a PMA account and it’s $12.50 for the business debit card if you have an expanded business account. We are partly automated. I have a primary checking acct with a major us bank. Both me and my wife’s paychecks are deposited here. From there, we have TEN separate ING accounts for savings activities from emergency to vacation to life insurance to a parking place for money that will later be moved to the stock market in larger lump sums. Movements into all of these ten accounts are automated. 401k is auto-deducted at work before the paycheck ever leaves the building. One of the ten ING accts links to Prosper.com, where I have a P2P lending portfolio on autopilot. I am slowly liquidating this position. Each weekday morning, I log in and transfer the cash balance from Prosper to ING. I also have a Prosper loan. Prosper automatically draws about $70/month from this account. This same account also is linked to Firstrade. I looked at Zecco but did not want to go with a company whose business model seemed to make them no $$$. I wanted stability, and Firstrade got good ratings. My experience there has been excellent. We pay our mortgage through auto-draft, but every other bill I pay online, but manually. I like to PUSH money out from my accounts rather than have it pulled. I also do not trust AT&T. I should probably have a diagram. You should consider creating a limited liability company (LLC) for your company. This would separate the assets of GRS from your personal assets. I hope it never happens, but if someone follows your advice and suffers a bad outcome, they might try to sue you. I know you have a disclaimer at the bottom of your webpage, but your blog is relatively prominent, and it might be considered to be somewhat authoritative, nonetheless. If GRS was an LLC, then you would only be (potentially) liable for its assets and not your personal assets (like your house). If you set up an LLC, you should have a separate checking account for your business and your for your personal expenses. The purpose of the LLC is to create a business entity, but then you are responsible for keeping the company assets separate — no co-mingling of funds. It’s not too hard, and in most states, you can do it online.